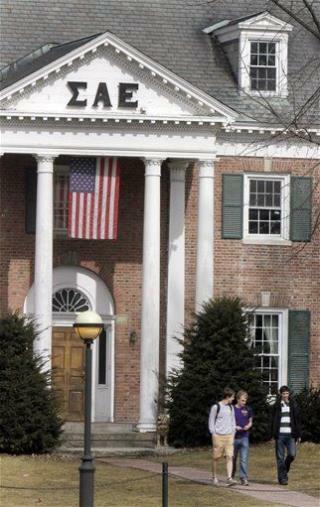 (Newser) – Sigma Alpha Epsilon is, according to Bloomberg, the "deadliest" American fraternity: Ten people have died since 2006 amid hazing, booze, and drug incidents tied to the institution. Now, it has made what it calls a "historic decision": It's barring the practice of pledging, starting tomorrow. "New-member (pledge) programming will be eliminated completely from our operations," the fraternity says in a statement. "We have experienced a number of incidents and deaths, events with consequences that have never been consistent with our membership experience." once again, ZT ideas are pusued...while I agree that no physical nor lawful endangerment should be part of hazing, part of the "hazing" (or just pledging) is showing that you want to belong. This can include learning about all the current members, doing chores around the house, doing your weekly mission Friday night (we had an 8 week pledge period followed by a full 24x7 weekend) which did NOT involve anything illegal. Yes, there are parties, but there are also sports, academic assistance, and community work that fraternities perform. Also, leadership opportunities for those that wish to be officers. As usual, as Really-IMeanReally pointed out, folks focus on the rare/bad exceptions and ruin a good thing for the vast majority! Yes, Obozocare is a prime example. Our country is best, when governed least. Everyone has an opinion, so here's mine - Any deaths and/or extreme hazing is a shame, pathetic and NOT what those organizations are about! People who weren't / aren't in a fraternity/sorority don't know what it is like except as an outside observer - even though they CERTAINLY can have an educated idea - what they think about them is based on the <1% of their existence, which of course is the negative! There are BAD PEOPLE & immature people in those organizations - just like in the non-greek population - people who NONE of the organizations want acting that way, but the organizations have an obligation to help those people GROW UP - which is what part of the "college experience' is about. Ending pledging because of the miniscule incidents is a bit like Obamacare - ending good healthcare for the 90% instead of simple fixing the problem in the other 10% - (the incidence in unacceptable hazing is WAY less than that)! Being in an organization or not being in an organization is what serves different people differently. As an SAE years ago, at a major southern University, we had PLENTY of independents who were more than welcome at MANY of our events - some are still lifelong friends even if not lifelong "brothers". As for Cornelison - "Getting rid of fraternities is a solution" - why don't you just become King and you can decide what EVERYONE can and cannot be a part of - thanks for thinking you know what is right and wrong for EVERYONE! And as for Bosda - "no longer needed" is your opinion - which, like I began with, everyone has the right to. That's just backwards - why not FIX what is wrong as PLENTY of GOOD comes out of these organizations. If people researched the amount of philanthropic services and donations these organizations are involved in, maybe you could see there is greater VALUE to society than there is bad! There are alot of good organizations on campuses, which do similar things, but for anyone who is in NEITHER, than their "value" to the community is ZERO - and that is still THEIR choice, but don't eliminate those who are doing good because a VERY SMALL number are idiots / immature and cause really bad things to happen. Bottom line - America, in ALL venue's, is about opportunities and individual differences of choice, along with the RESPONSIBILITY of those choices - take away the reasonable choices and you are not the Free America, you are the Socialist or Communist state (and there are other places you can move to if you like that style of society). Thanks for letting me state my opinion!